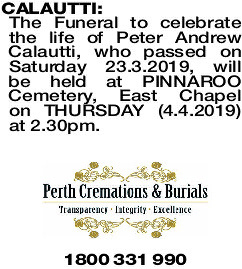 The Funeral to celebrate the life of Peter Andrew Calautti, who passed on Saturday 23.3.2019, will be held at PINNAROO Cemetery, East Chapel on THURSDAY (4.4.2019) at 2.30pm. Passed away peacefully at home 23.3.2019. A beautiful soul, you left me beautiful memories. Your love is still my guide and though we cannot see you, you're always at my side as life gave me the gift of you. 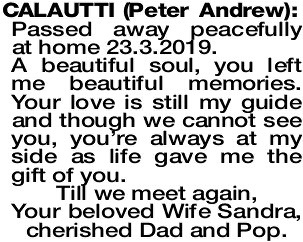 Your beloved Wife Sandra, cherished Dad and Pop.